I’m just back from two weeks in Morocco! I’ve been fascinated by Moroccan food and culture and have wanted to go for years. In fact, when I hosted the very first cooking club meeting the theme I chose was Morocco. The trip was really fun. I decided for my first visit I would join up with a tour (something I’ve never done before) so that I could make sure I understood customs before venturing out on my own. In most ways this was a very good choice and it also allowed me to see much more of the country than I would have on my own. However, it did have a little of the “If this is Tuesday it Must be Belgium” sort of feel to it. Before leaving on the trip I’d already begun planning a Moroccan dinner that I’d have when I returned. Since we are rushing into the holidays the dinner will be in January and that allows me time to make a batch of preserved lemons, an ingredient found throughout Moroccan cuisine. Although you can buy preserved lemons, they are really easy to make, you just need a little time to let the process work. I’m using the recipe from Paula Wolfert’s The Food of Morocco. If you have access to Meyer lemons, use them. They are similar to lemons found in Morocco. 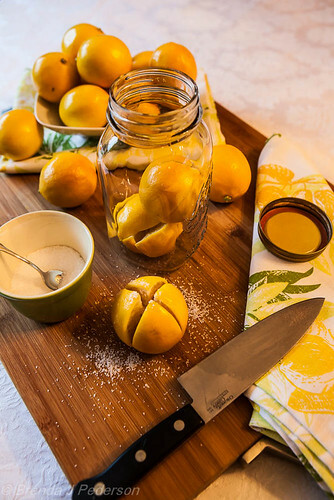 Soften the lemons by rolling them back and forth on a counter or cutting board. Quarter the lemons from the top to within ¼ inch of their bottoms. Generously sprinkle salt on all the exposed flesh, then reshape the fruit. Pack into a glass jar, pushing them down and adding more salt between each layer. Top with more lemon juice, making sure the fruit is completely covered. Leave some air space before sealing the jar. Allow the lemons to ripen in a warm place (the countertop is fine) for 30 days. Every few days turn the jar upside down to distribute the salt and juice. If necessary, open the jar and add more juice to keep the lemons covered. After 30 days store the lemons in the refrigerator where they will keep up to one year. To use the lemons, pull one out of the jar and rinse it under cold, running water. Remove and discard the pulp unless the recipe specifically calls for it. Generally you’ll only use the rind. Love P. lemons!!! I made 30 pints this year! My sister shipped the Meyers to me cheaper than I could get them at home here in the Pacific Northwest. I have used them in all kinds of recipes. Love them!!! 30 pints! Wow! Do you give them as gifts or do you use them all? I’ve made them in the past and am looking forward to this new batch.